Packing for holidays can be stressful, we don't want to forget anything and make sure we spend the best time possible. After a few trips, we all develop our list of little tips and tricks to get us through. Yet, when it comes to business travel, the pressure always seems to be intensified. Nobody wants to mess up a meeting because of a forgotten computer charger or no back up storage. We've experienced some pretty bad/funny situations and we would like to share with you what we've learned and hopefully help you avoid disasters. Below a list of things you can't leave home without — a couple of must-have products, services and apps that'll make your life a lot easier when abroad for work. Right when you’ve checked in your bag at the airport it dawns on you — you forgot something at home. While it might seem impossible to bring everything you're supposed to, there are a couple of travel essentials you should never forget. If you struggle with hearing the music from your earbuds while on a plane, it's time for an upgrade. You won't forget the first time you put on noise-cancelling headphones — the noise around you melts away to a point where you wonder if the plane is still flying properly. The two best contenders are Sony's MDR-1000X and the Bose QC35, and it's pretty easy to pick one. Go for the Sony if you want superior sound, and pick the Bose if you care more about comfort. Neither of them come cheap, but trust us — it's the best investment you can make if you spend lots of time on a plane. Maybe you've already seen all the movies on the in-flight entertainment system, or maybe you just like to use your own devices instead. And after landing, you definitely want to make sure your phone's never out of battery — if not, you might miss an important call or end up stranded without access to Uber. If you use any mobile devices, it's worth getting a battery pack. There are a lot to choose from, but the best one for most people is the Anker PowerCore 20100. It lasts long enough to charge most smartphones seven times and most tablets four times — more than enough to get you through the week. If you need to get lots of work done on the plane, or just want to use use your laptop a lot, it's worth considering the PowerCore+, which can also charge a USB-C enabled computer. 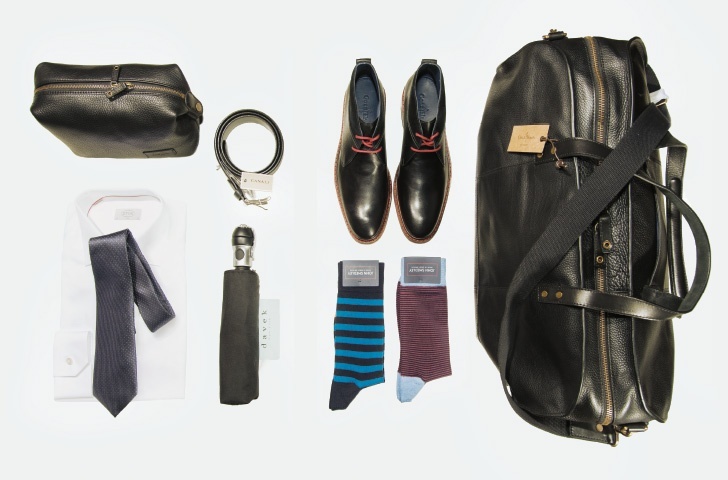 The best thing to bring on a business trip is also the easiest — a set of fresh clothing tucked into your carry-on bag. It might seem like a strange idea, but with the amount of bags that get lost on flights it actually makes a lot of sense. If you and your bag ended up at different airports, it'll take a couple of days for the airline to return your belongings. In the meantime, you won't be stuck wearing the same outfit — something that comes in handy if your calendar is full of business meetings where you have to look presentable. It’s not just about what you bring, it’s also about the services you use — some of them can be a real life saver. Wherever you're going, you need to stay connected. Because telecom providers generally don't like it when you go abroad, you're paying high premiums for using your phone in other countries. You could try hopping between Wi-Fi hotspots, but that'll leave you with dropped connections at inconvenient times — it's a much better idea to buy a prepaid data SIM and use your mobile connection instead. To find the best deal for a SIM card in the country where you're headed, check out the Prepaid Data SIM Card Wiki, which gives a clear overview of all offerings per country including recommendations for what to buy. If you live and travel within the EU, you're in luck — from June 2017 it's been possible to'roam like at home', which means you can use the same data plan you have in your home country. For foreign travelers coming into the Union, this means they can buy a SIM card in the first country they visit and use it in all member states. It's a dark scenario, but what if your laptop gets stolen? Does it contain sensitive information? Do you have backups? If you answers are yes and no, it's time to do something about it. Making backups of your laptops is a struggle, which is why too little people actually do it. That's why you should consider Backblaze, a cloud backup service that does all the work for you. It automatically and securely backs up your hard drive to the cloud, giving you peace of mind for when disaster strikes. When your expensive tech gets stolen, you might think there's no chance of getting it back — well, not if you're smart about it. On your iOS and Android devices, make sure to activate Find my iPhone or Find My Device, so you know where your devices are at all times. For your laptop it's worth taking extra precaution by using Prey, a suite of tracking tools you can activate when it's lost. Hand over this information to the police, and they'll be able to assist you with getting back your valuables. Nobody leaves on a business trip without their trusty smartphone in hand, as it can be a great tool while traveling. This selection of apps make it just that much more useful. When you run into a language barrier of any kind, Google Translate is the perfect app to turn to. While its hallmark text translation is as good as it's always been, it recently gained much more interesting features. Word Lens lets you point the camera at any foreign text and magically overlays the translation in real time, and its support for bilingual conversations makes it possible to talk to anyone in a language you're comfortable with. If you're sticking around for longer, it could be helpful to grasp a bit of the local language. Duolingo is an easy wayto learn a couple of basicwords and sentences, with a friendly learning method and an even friendly price tag — free. The best way to find great places in a city. Looking for a place to get your morning coffee? It's just a couple of taps away. Need to impress a client with a great dinner?Yelp will point you to the best restaurants around. Follow the steps and enjoy your stress free business trip.